I was confused with Rei's and Miku's shirt pattern, so don't complain about it =3= And the camera obscura, oh my, took too much time to dealing with that 'thing'! I never, ever want to drew things like this again! AND my drawing style totally not fit! My sister told me that Kei and Rei looked younger than the original! 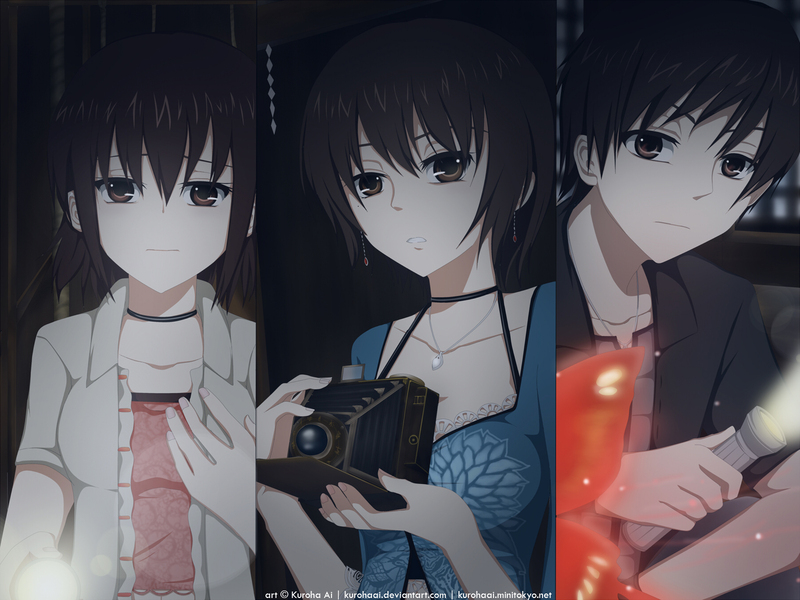 Browse Fatal Frame Gallery: Recent | Popular. You make me remember of the horror! meeeeh...it looks good that they're younger! makes me hope that yuu is alive too :( I think rei has been really strong. I think too much would get lost in translation over into anime format if they tried it... The storyline is beautiful, but it would lose a lot of the original effect. I mourn the fact that this is not a widescreen ;-; You've done a nice job converting them in to the anime style :) Both of the girl's blouses look very nice, and even if they aren't entirely accurate you've done a great job mimicking the originals so that it looks great anyways. The camera was well-drawn and I like that you can see the edge of a crimson butterfly in Kei's portrait. I really like this piece!